This species was first recorded in Britain by Meade (1855) at Hampden in Buckinghamshire in August 1854. Meade (1861) provided further records from Brighton in 1856 and near Winchester in 1860. Homalenotus quadridentatus is currently recorded south-east of a line drawn between the Humber Estuary and the Gower Peninsula, although Hillyard (2005) notes its presence at Malham in Yorkshire. Its European distribution includes the Azores, Portugal, Spain, France, Belgium, the Netherlands and Switzerland. Homalenotus quadridentatus is restricted to calcareous soils (Wijnhoven 2009) and is found in grassland and woodland (especially open beech woods). It is a flattened, short-legged, ground-layer species which should be sought under stones and logs and also at the base of plants and in leaf-litter. It can be caught by sieving or pitfall trapping. The adults (but not juveniles) are often encrusted with soil, presumably as a physical, chemical or visual camouflage. British records give altitudes of up to 225m, compared with 1800m in the Pyrenees (Martens 1978). It is not clear whether this species' distribution in Britain is restricted solely by soil type or is also limited by temperature. 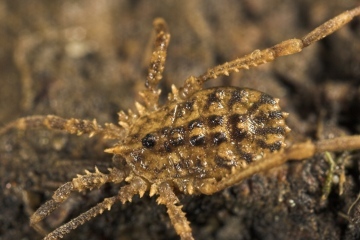 It fills a similar niche to Trogulus tricarinatus and Anelasmocephalus cambridgei but virtually nothing is known about its feeding preferences - Sankey (1949) lists a mite! Restricted distribution but relatively common where found. Martens, J. 1978. Spinnentiere, Arachnida: Weberknechte, Opiliones. Die Tierwelt Deutschlands 64: 1-464. Fischer Verlag, Jena. Meade R. H. 1855. XXXV. Monograph on the British species of Phalangiidae or Harvestmen. Annals & Magazine of Natural History 2nd Series 15 (90): 393-416. Meade R. H. 1861. XXXIX. Supplement to a Monograph on the British species of Phalangiidae or Harvestmen. Annals & Magazine of Natural History 3rd Series 41: 353-357. Pinto-da-Rocha, R., Machado, G. & Giribet, G. (eds) 2007. Harvestmen: the biology of Opiliones. Harvard University Press, Cambridge MA.